It speaks in melodies and harmonies, in notes and pregnant pauses, in complex repertoires and minimalist arrangements. And just as every song has a message, and every message has a song, every brand, too, has something important to say. It could be a clarion call to embrace the champion within us as screamed by Freddie Mercury, a move-your-feet-to-the-rhythm ditty to explore the fun side of life as extolled byGloria Estefan, or a sterling opera that provokes us to think differently like Nessun Dorma, forever linked to Pavarotti; it’s all about how we connect with the things that matter. Because a great brand, like a fantastic song you can’t get out of your head, is a powerful unifying force; it stirs emotions, provokes action and inspires individuals, communities and the world to make their lives better. More importantly, like music, a great brand is also universal. 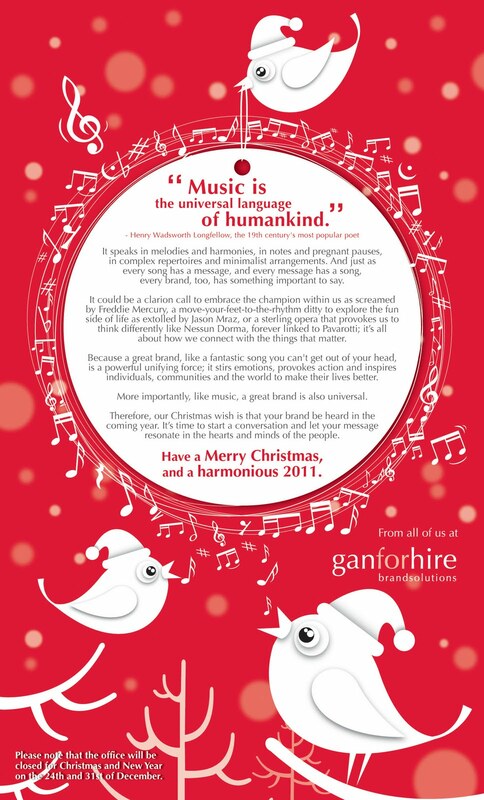 Therefore, our Christmas wish is that your brand be heard in the coming year. It’s time to start a conversation and let your message resonate in the hearts and minds of the people. Have a Merry Christmas, and a harmonious 2011! Have a Jolly Green Christmas!